I'm trying to sort out some timing issues within my gameloop and I've seen something that I don't understand. The Nexus 10 is supposed to have (as far as I'm aware) a VSync on 60Hz. So that would be mean would it not that onDrawFrame is called by the system every 16.66ms? Why is it not a constant 16.66 or is it just that nanoTime isn't acurate enough to give a more exact reading? First, as Matthew said it's not going to be exact because of fill rates and whether the `onDrawFrame' is called before or after you do your drawing. But this would by my approach. First, I'd average over several seconds. Remember that just printing to the log takes time. You don't need to know the FPS every frame, just the average every few seconds. Second, I would only capture the time once, not multiple times. Use that captured time for everything that needs a time base. You can change the 5.0f in both places to be whatever amount of time you want to check. Just make sure you change it in both places. If you want to print out the average time per frame instead just swap the formula to be 5.0f/fpm. fps is frames/time. time for one frame is time/frames. Video frame flip times are very consistent. However, this is no guarantee that onDrawFrame is being called precisely the instant after a video flip. As you've measured, it is not particularly timely. If the system is not heavily strained, you can get an accurate measurement of the frame rate by averaging the values above. If the system is heavily strained, however you will start getting dropped frames in which the computer does not have enough time to fill the image buffer before the flip. 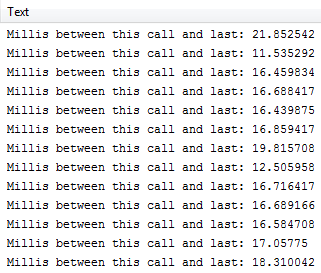 In this case, you will start seeing multiples of 16.67 (plus random error) in your measurements. Even though the hardware frame rate is 60 Hz, there will be less than 60 frames displayed each second. Not the answer you're looking for? Browse other questions tagged opengl-es2 timing vsync profiling or ask your own question.